One of A Kind Piece! 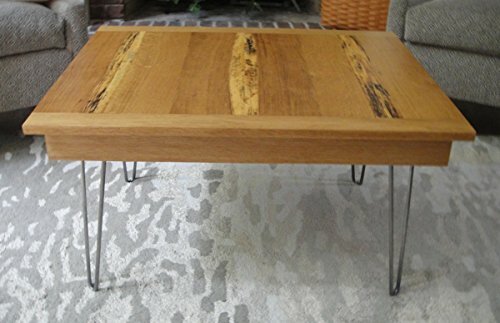 This mr2 Industrial Style Coffee or Accent Table is made from solid reclaimed oak. 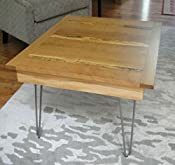 The table is 33" Wide x 27" Deep x 20' High with Raw Steel Hairpin Table Legs. The piece is a mid century modern style. All of the surfaces are fine sanded and finished with multiple coats of lacquer to bring out the beautiful grain patterns and textures. A matching side table made from the same wood stock is also available on this website. The top was made with oak boards that were selected for their grain and color variations. Each piece was then cut and matched to create the structure and patterns. Each board has been secured with biscuits and compression gluing for maximum strength and joint flushness. The top is secured to the oak apron with pocket sixteen pocket screws. The Hairpin Table Legs are secured to the table top with twelve #10 Screws for maximum strength and stability a (See Underside). The table ships with the four Hairpin Table Legs packaged separately for safety and economy of shipping. Each piece is individually bubble wrapped and multiple layers of cardboard are used for maximum protection in shipping. Shipping and insurance costs are estimated for delivery to the West Coast. If the cost is less, a refund would be provided. mr² Woodworking also has unique custom furniture, benches, cabinets and specialty wood items.